I bought these gorgeous red echeverias from Buck Hemenway quite awhile ago. 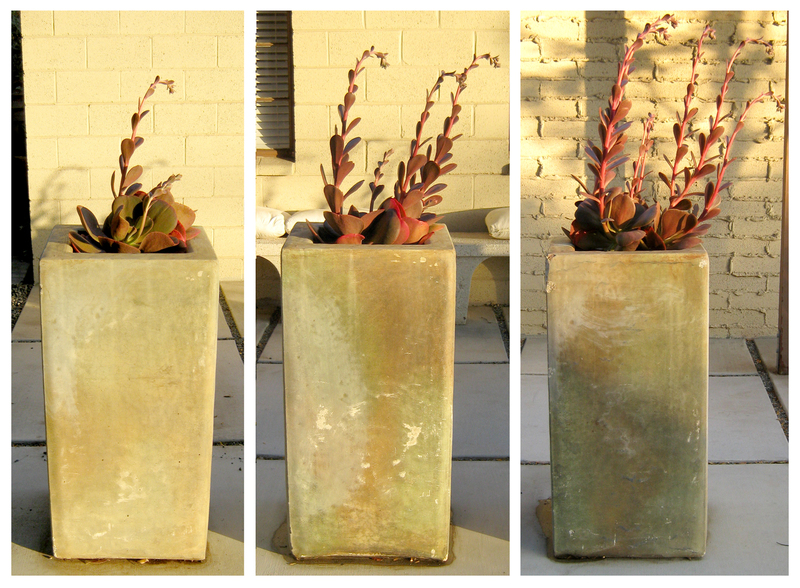 All were cuttings at the time; all were the same size, planted in the same soil mix, in the same concrete planters. I watered them the same and they grew at the same rate, becoming similarly thick with wine-red pads and making great living finials atop the planters that delineate the Rancho’s front-yard patio. Then, about a month ago, the stalks began: one in the left-most planter, more in the center, the most on the right-hand … but why? Why would three plants — from the same original source, planted in the same location, the same soil and same type of vessel — grow so differently? Can’t say why one is larger than the others, but they appear to be echeverias. You can propagate by placing the cut and calloused flowering stalk in wet clean sand. Little plants will grown from thes stalk and when rooted can be detached and planted. Gawd, thanks, Marjory, I must have had kalanchoe on the brain! Your description of a ‘cut and calloused’ stalk is exactly what I bought and planted. Today I opened the front door and realized I had a huge one like yours right across from the door. I will have to remember to take flower stalk cuttings. I agree about moving the potters around — a microclimate effect may be at work. Or one cutting had a better root system, or one pot had something leaching out that affected growth. As for OCD, it really helps with gardening. One has to get that last weed or fallen leaf picked up…. Omg, to move those hernia-inducing concrete pots? No thanks! I will enjoy my echeverias unconditionally, as they are… Congrats on yours, Marjory! Interesting problem and I’m just OCD enough to start fiddling with them to satisfy my need for straight and equal. 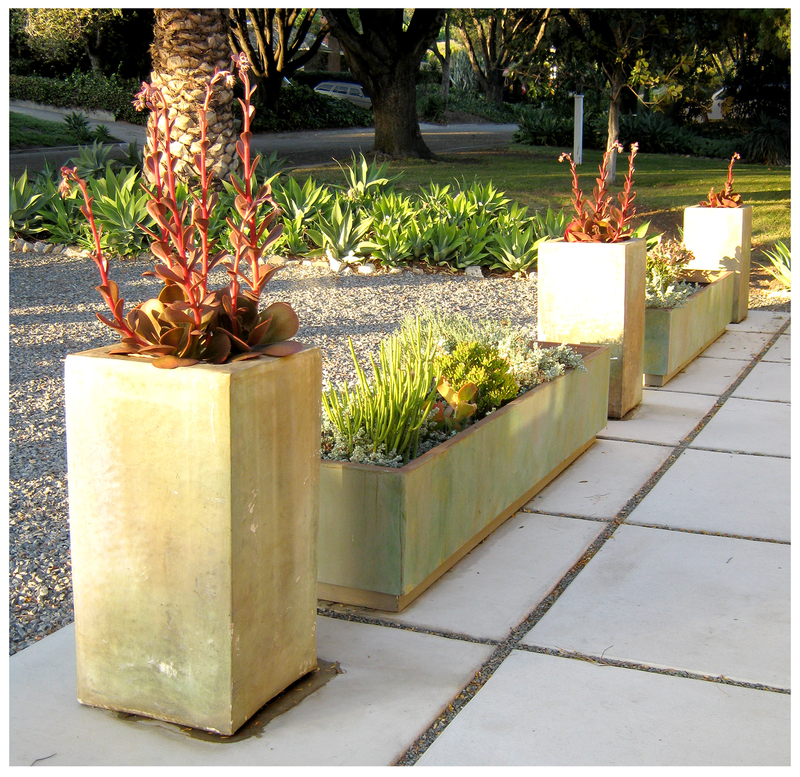 hahaha I’d start by moving the planters around like a shell game thinking maybe one’s getting more sun or more something. Also, I’d put the tallest one in the middle for God knows what reason. Crazy making…then I’d probably lie down or something. Finally! Someone who understands my plight … thanks for the comment. A good lie-down always helps, I find. Are they leaning toward the front door? I think they are leaning in to get affection from their owner, and you unconsciously give more love to the ones closest to the door. The poor little guy farthest away…. he needs love too! These plants have behaved very interestingly … most recently all three became huge; each branching off into threes … so I split them, keeping one branch per pot and planting the remainders in the ground in the backyard … all of them, the potted ones and the backyard versions have become huger than huge and can’t be stopped! Gawd, I love succulents … such amazing plants! No…, You’re amazing! I have had this plant for at least 3 years and it has done nothing… nothing!!! Still tiny and spindly! This is some of the clippings that I took to plant next to the dog kennel. I have probably killed it. Interesting, I bought these from local succulent expert/propagator, Buck Hemenway, and they were mere cuttings … I literally just stuck ’em in the potting soil and they did the rest …. Hmmm… maybe I should take some of my own advice and give it some love!! Yesterday I trimmed a huge plant that was shading it, maybe that will help. It could work … but I need to say when it comes to plants I really don’t go to great pains … they have to take care of themselves at the Rancho … hence, my love of succulents!